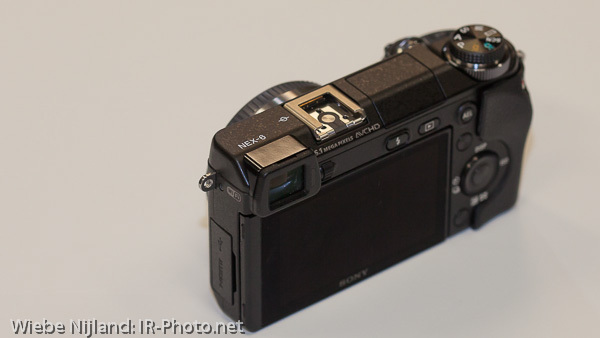 The Sony NEX-6 was released October 2012. 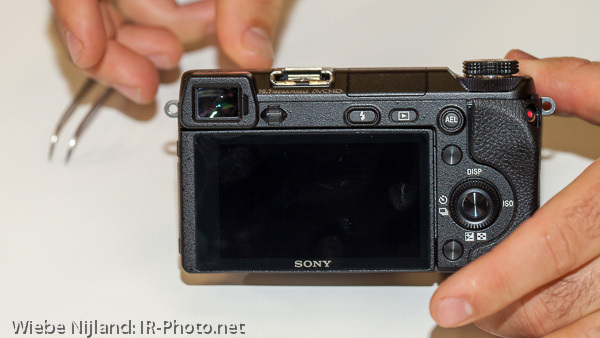 It has the Sony E-Mount, a 16Mpix APS-C format sensor, 3" tiltable screen, and a 2.3Mdot OLED electronic viewfinder. I think it is a very good choice as IR camera because of the great sensor, electrnic finder, and a very good feel and handling to it. In this tuturial I take it apart to remove the IR-block filter. In this camera the filter is not replaces with anything. 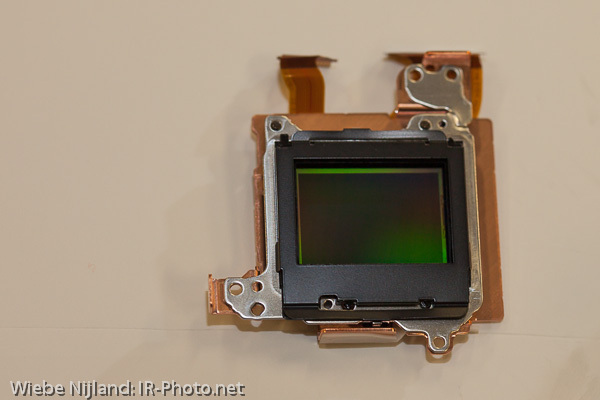 There remains a transparent glass cover on the sensor, and we don't need to consider any changes in the focus beacause all focus and metering is done on the main sensor. Removing the internal filter will decrease the close focussing range for a tiny bit, but this is no real issue with most lenses. 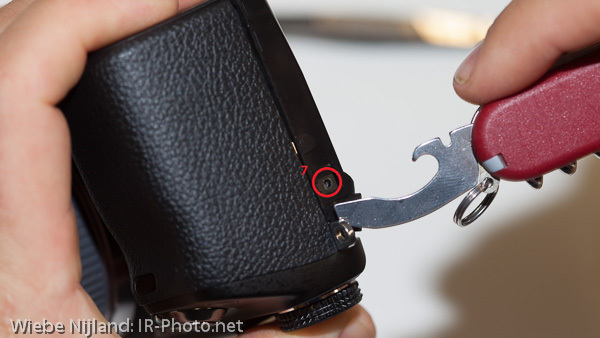 Remove the lens, battery, strap, eye cup and any other accessories. 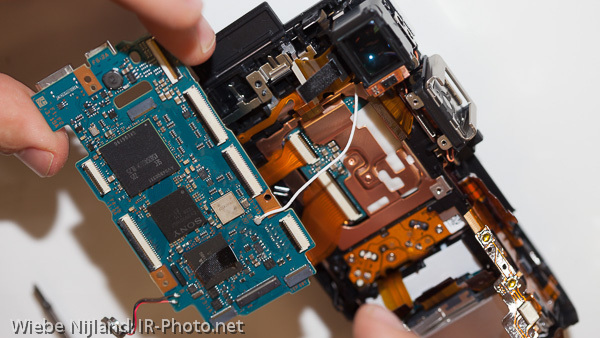 Quickly clean the outside of the camera body with a brush or damp cloth. Have a neat and clean table top. Screwdrivers: crosshead (Philips) #00, small Flat (~2mm). A rocket air blower or some canned air. 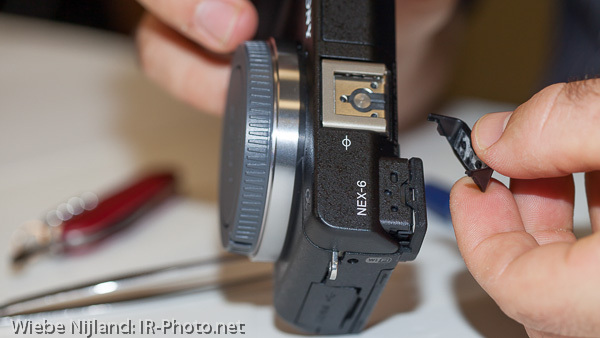 The NEX-6 Is a very small camera for all of the things that are inside (large sensor, tilt screen, built in flash, etc). 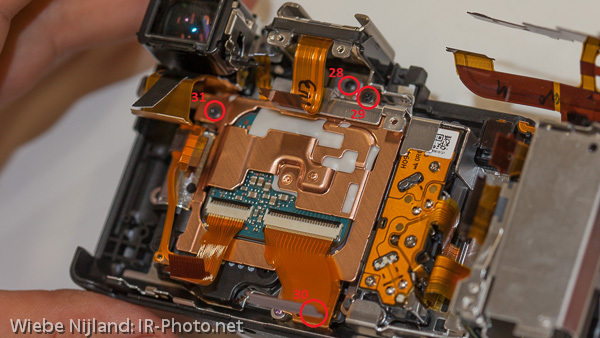 Sony did a great job on cramming all these parts inside and keeping it well organised. 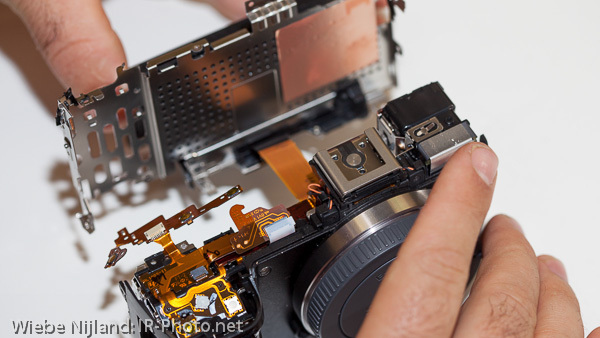 But, taking it apart is not so easy as wiht bigger cameras. I would not recommend this model for first time converters, an older SLR model with live-view like the EOS 450D, or even the NEX-5N which has a little less parts would be better. But if you have a little more experience, it is surely possible adn you will get a very nice tool\toy! 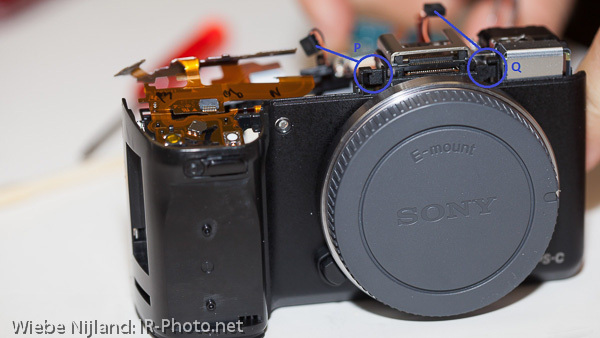 Remove the to and back panel of the camera (10 black screws) Two screws on the bottom (1 + 2) Two screws in the left side (3) between the usb and hdmi sockets, and (4, longer) at the strap connector. 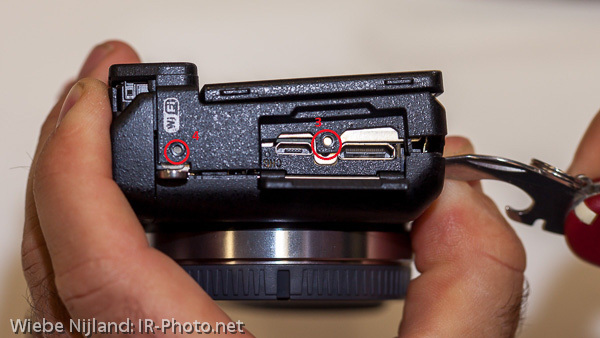 Two screws at the pop-up flash, (5) mid back and (6) in the front left corner. One screw at the right side (7) under the rubber grip. Remove the grip and set aside. 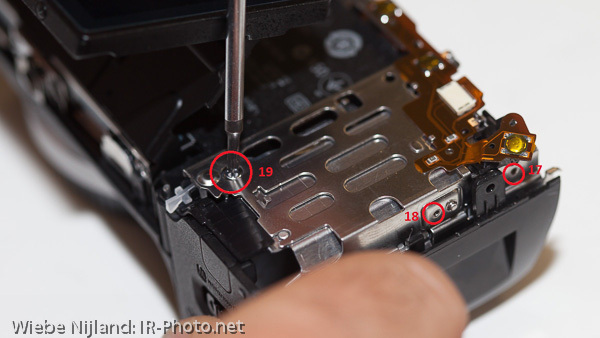 Three screws in the battery compartment, (8) at the very right side and (9 + 10) at the bottom of the battery compartment With these screws removed the top should pop come off with little force and so should the back cover. The top has two ribbon cables (A + B) that just slide out. One connects the flash (A), be especially carefull with that as there may still be some charge in the capcitor (this is a very high voltage, zapping yourself hurts a LOT!). 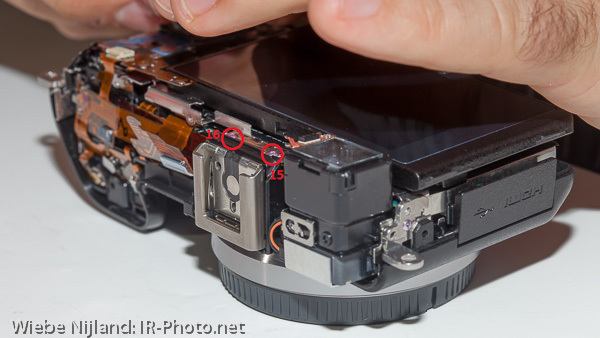 There remain some charged spots on the top part, so do not tuch the exposed parts! you can safely hold the camera by the flash hotshoe. The rear panel is just a plastick cover and wiht a little fumbling you will be able to remove it over the still attached tilting screen. 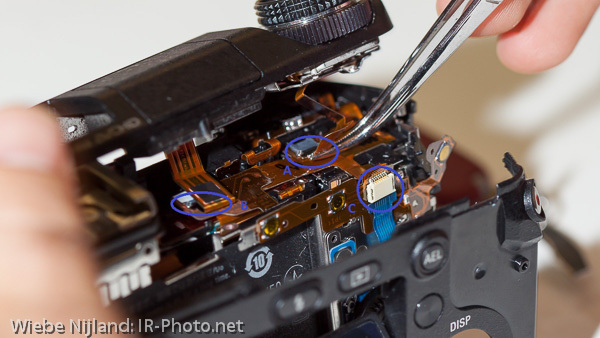 the blue control wheel unit can be easily removed by sliding out the ribbon cable (C) and sliding the unit up out of its clips. Remove the main circuit board ( ribbon cables, 3 + 1 screws) The main circuit board is covered by a protective black plastick shield, remove that and set asside. Now we have to disconnect all ribbon cables. Many of the ribbon cables have a hinged locking tab (black or gray) that needs to be flipped up before sliding out the cable. Cables (E, F, G, I, K, and L) have a locling tab, (H, J, and M) are of the slide out type. 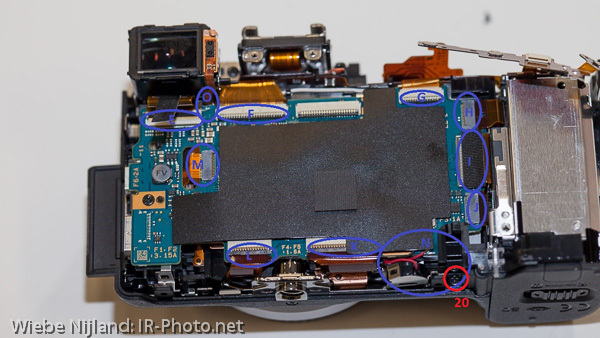 At the bottom right of the circuit board there are two small red and black cables (N) connected to a speaker. 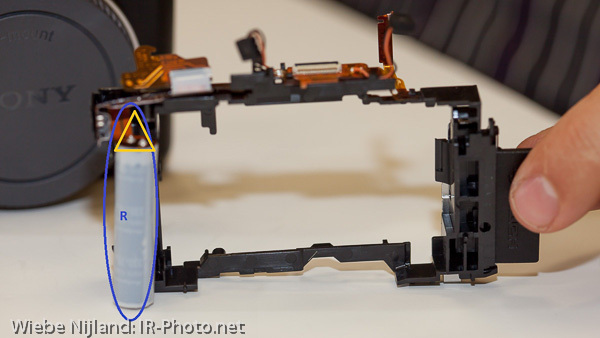 The speaker is set in a plastic unit that also holds the battery door and comes out after removing one screw (20). 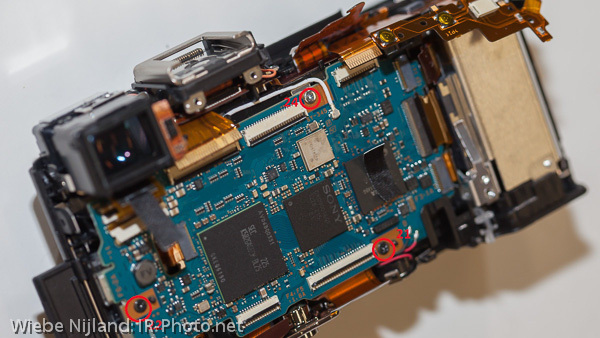 The circuit board is held down by three screws, bottom right (21, black), middle left (22, black), and top right (23, silver). 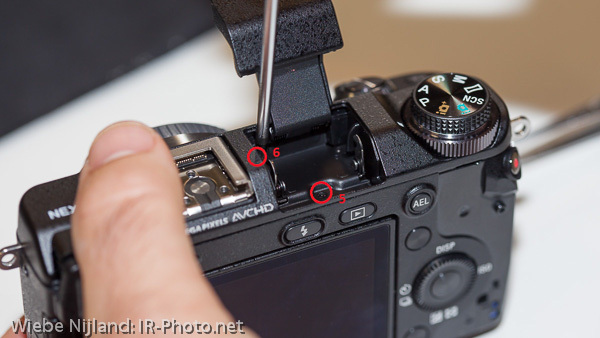 The two black screws are a little harder to remove, use enough care not to strip the heads. 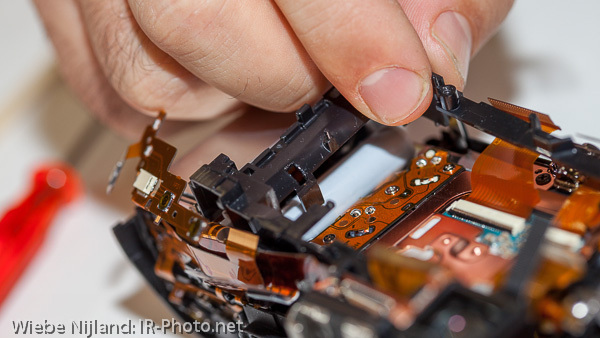 lifting the circuit board up, it is still connected with one ribbon cable at the back on top (O) (this is connects the dust shaker and is not replaces when putting it back together) the ribbon simply slides out. As the last connection there is a white cable (likely to the wifi antenna), it is connected at the front cover and can only be taken out after removing the frame in the next step, be careful not to damage this cable when working the frame! Take out the black plastic frame Whithin the housing there is a black plastic frame around the sensor and other components. 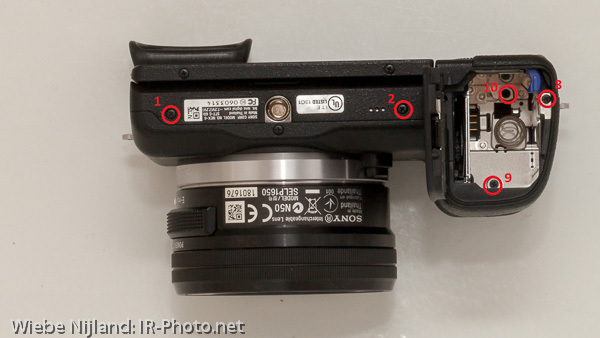 The frame holds the flash capacitor and has some ribbon material and connects to the stereo microphones at the front of the camera on both sides of the hotshoe (P and Q). The black frame is not screwed down, but sits under and over lots of ribbon cables and ohter fine components. Remove the two microphones and very carefully remove the frame. Do not tuch the contacts at the flash capacitor!! (R). 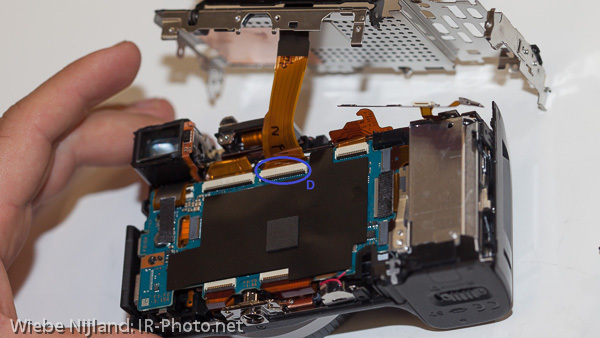 Once the frame is lifted up, you can remove screw (24) that secures the wifi antenna still connected to the circuit board. Now set both the frame and the circuit board aside. 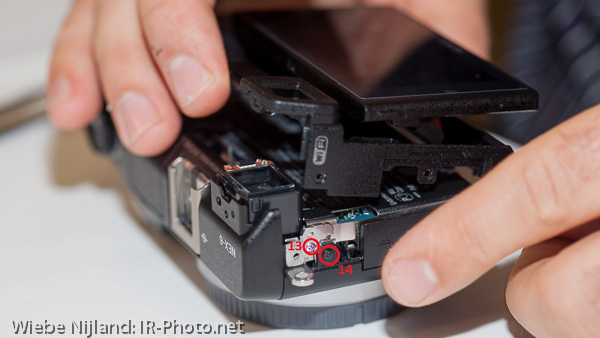 Take out the sensor (4 + 3 screws) Before taking out the sensor there is one last frame to take out, it sits around the top and right side. The frame is held by four screws, two on the right (25 + 26) and two on the top (27 + 28). the frame easily lifts out. 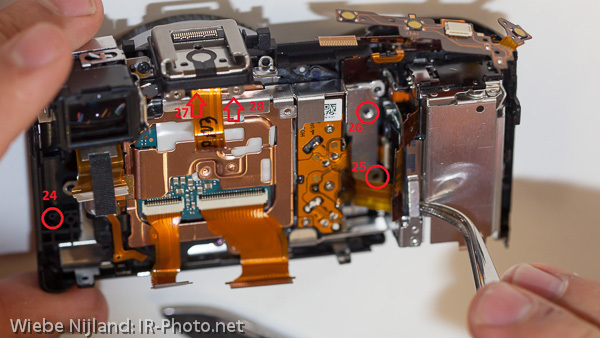 Now there are only three screws left to take out the sensor, top right (29), bottom right (30), and left (31). The sensor sits on shims to ajust the exact position and pitch, it is easiest just to leave those in place so they don't get lost or mixed up. Change the IR-filter Whith the sensor removed from the camera, we can change or remove the IR-block filter that sits in front of the sensor. 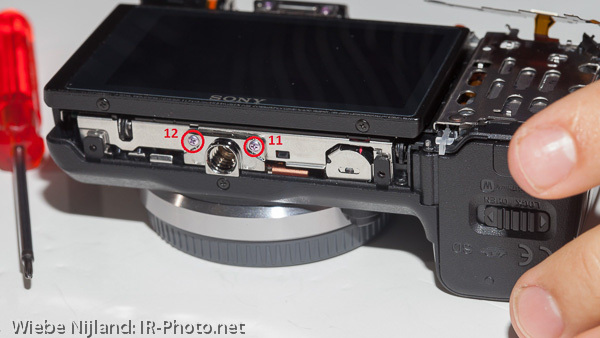 Sony made it very easy, the filter is only held in place by a springy black metal frame that simply unclips. In this conversion we just remove the filter, but you may want to replace the filter with some custom one to get a dedicated conversion for specific wavelengths. 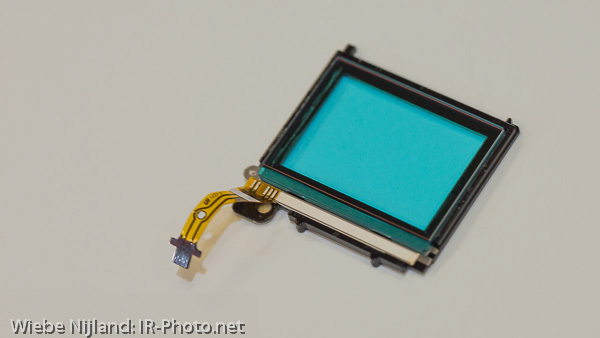 the original filter is two layers of glass sandwiched together (~ 22.6 * 28.75 * 1.25 mm) with a piezo dust shaker attached. If you install some replacement glass, make sure to work very clean and do not trap any dust between the filter and the sensor as it will show very clearly in your photos. We are done! Put the battery in, attach a lens, and take pictures. If there are errors, don't panic. First start with checking the ribbon cables, it is easy to miss one or not get it completely seated, and also easy to fix.